This week, I got the best BCA products and decided to share how I used the products. I had a BCA day. First, I prepared a smoothie bowl and I had mama noodles for lunch and dinner. These past few weeks, I haven't really been eating a lot, which is surprising for me, because I usually eat a lot more. If you like to eat more, I'd suggest eating a snack inbetween these meals. Najprej sem si pripravila majhen smoothie bowl, za kosilo in večerjo sem jedla pa mama rezance. Zadnje par tednov ne jem prav veliko, kar je pravo presenečenje, saj ponavadi pojem vse, kar mi pride pod roke. Če rada poješ malce več, priporočam, da med obroki še kaj poješ. Teli mama rezanci so ravno pravšnji za moje prehranjevalne navade zadnje tedne. Obožujem riževe rezance in če jih obožuješ tudi ti, klikni TULE. Vsi rezanci se ponašajo z znakom kakovosti ''Thailand trust mark''. No, sedaj pa k receptom. Pretty simple, I just blended bananas, coconut chips and chia seeds with just a little bit of coconut milk. 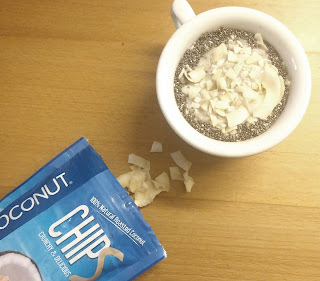 I added some crushed up coconut chips and chia seeds to the top, and that was it. 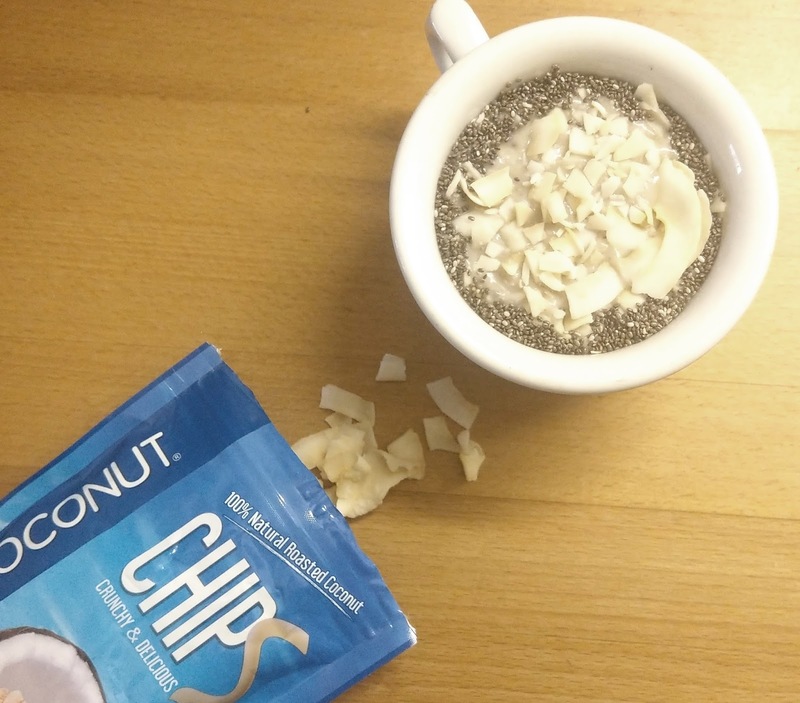 I've had a lot of coconut chips in my life, but these ones are the best, take my word. They aren't as thin as most, and they are super crunchy, which I love. Tale recept je zelo preprost. V blender sem vrgla dve mali banani s kokosovim čipsom in chia semeni in čisto malo kokosovega mleka. 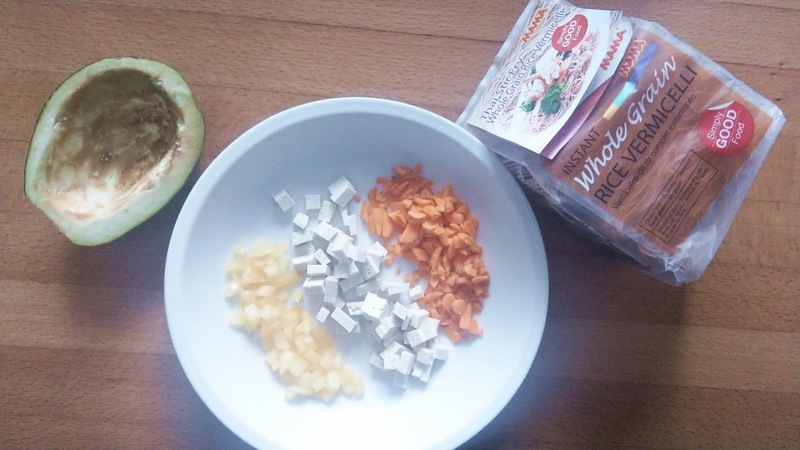 Na smoothie bowl sem z roko ''zmlela'' kokosov čips in posula chia semena. Probala sem že veliko kokosovega čipsa, ampak tale je najboljši! Malce debelejši je kot drugi, ampak tako lepo hrustlja, kar pa obožujem. Definitvno priporočam. 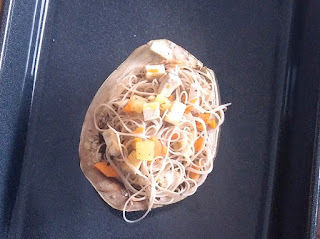 First, you slice the eggplant in half and carve it, so you will be able to put in the noodles. When you've done that, you will put it into the oven (180°C) and let it bake for a bit. Najprej, po dolgem prereži jajčevec, da boš lahko vanj dala rezance. Daj ga v pečico za 180°C in peci med pripravo jedi. 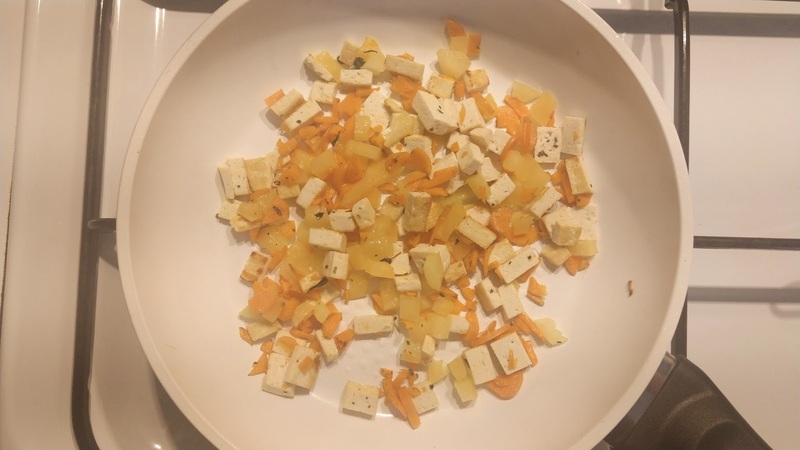 Chop up the carrot, bell pepper and tofu and put it on medium heat onto a pan with a bit of coconut butter. I spiced it up with basil and pepper. Once that is golden brown, put it away and boil water for the Mama noodles. Na malo razreži korenje, papriko in tofu in na srednjem ognju in malce kokosovega masla peci. Jaz sem svoje začinila z baziliko in malo popra. Ko porumeni, odstavi in pripravi vodo za riževe rezance. When the water boils, put in 1 portion of the noodles and let it sit for no more than 3 minutes. When the 3 minute mark is over, go ahead and rinse thoroughly with cold water. Then just mix everything together. Ko voda zavre, odstavi posodo in raj vanjo riževe rezance za ne več kot tri minute. Po treh minutah jih precedi in dobro speri z mokro vodo. Nato zmešaj rezance in zelenjavo. Take the eggplant out of the oven and put the noodles and veggies into it. Put it back into the oven for 1 more minute. Iz pečice vzemi jajčevec, vanj daj mama rezance z zelenjavo, nato pa vrni v pečico za dodatno eno minuto. To je to! Dober tek! Don't worry about the leftovers, we'll make them for dinner. Ne skrbi glede ostankov, porabili jih bova za večerjo. If you only cooked for yourself, you should have enough noodles and veggies left from lunch. Mix it all in a pan on medium heat and just add some soy sauce. That's perfect dinner when you're just winding down and don't want to cook. Če si kuhala samo zase, bi ti moralo ostati dovolj rezancev od kosila. Vse skupaj zmešaj v ponvi in dodaj malo sojine omake. To je super večerja za večer, ko se sproščaš in se ti niti približno ne da kuhati. I hope you liked the recipes and if you prepare anything, make sure to let me know! Upam, da so ti bili recepti všeč, in če jih pripraviš, mi sporoči! 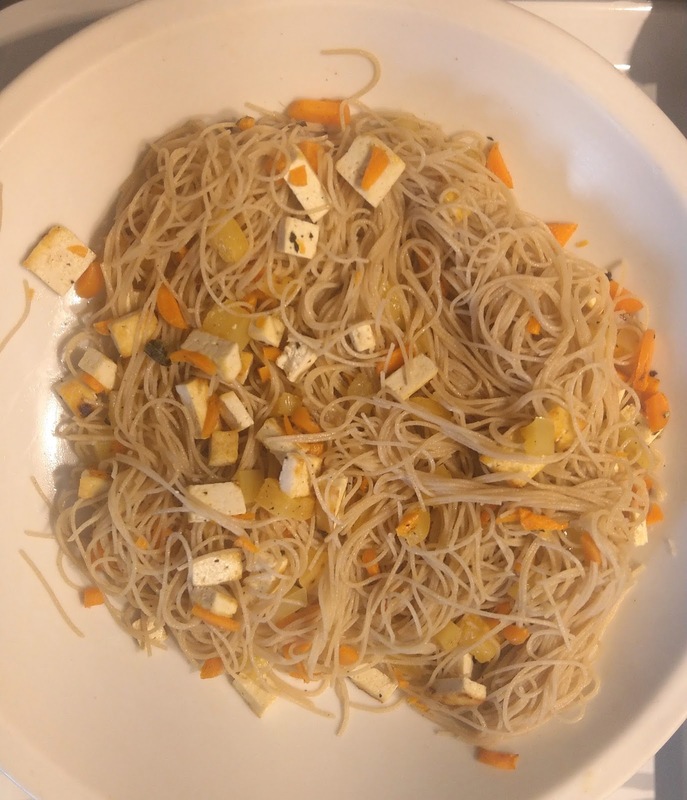 This is was an intressting recipe! Having fried noodles in a cup of an eggplant! Very original! I must try it because we eat a lot of noodles at home. And I could drink your smoothie every morning! Must very filling so you dont snack between the meals! Great way to lose weight! I like the simplicity and ingredients of the smoothie which does sound quite healthy. The lunch and dinner options are great because they flow into one another and look really easy to create, while having different flavours. Nice post. Ooh I love to see what other people eat, I am very nosy like that! 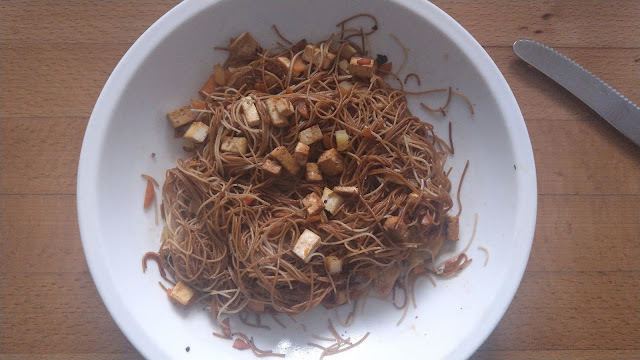 Those noodles look amazing, you eat very healthy! What is BCA? I am getting inspired to cook some fun meals after reading this. I love eggplant and just found a good deal on it so I may trying something with that! Thank you! Interesting recipe. 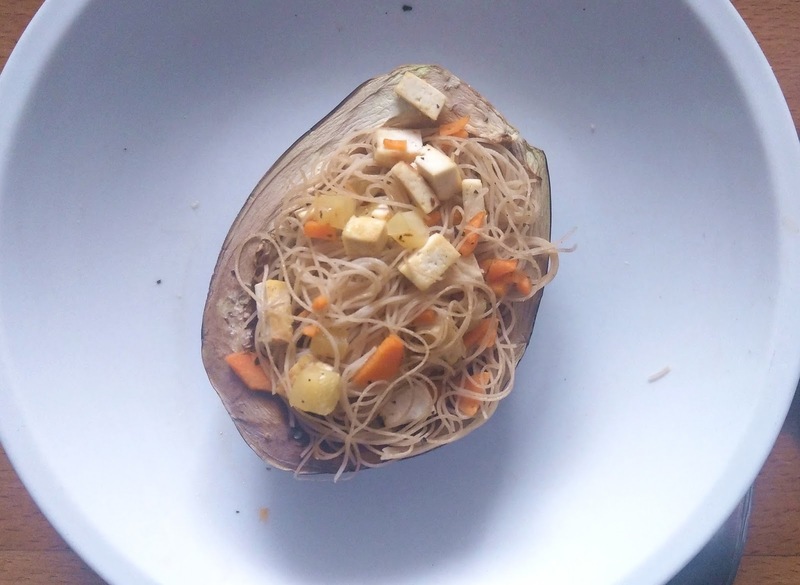 I like the carve eggplant with the noodles - I need to try this. Looks fun and yummy. This was a day very well spent in terms of food. I'm usually very lazy when it comes to cooking for myself alone but the meals you prepared look great for a lazy person like me too. I love using lunch left overs for dinner and vice versa. I'll try your recipes by tweaking some ingredients if I can't find all that you mentioned. 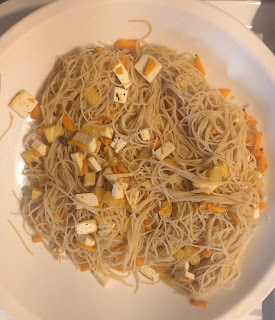 I love using rice noodles and coconut in my dinner recipes too. 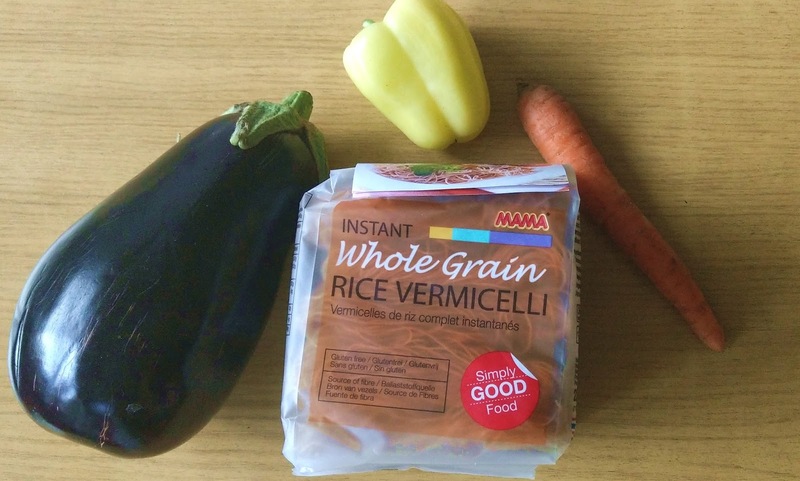 This looks so healthy and delicious, I would never have thought to serve it in an eggplant as a bowl though! My favorite recipe was by far the smoothie. All those ingredients mixed together sounds amazing and filling with the chia included. I can't wait to give this a try with some protein powder for a nutrient packed post workout shake! Such an interesting recipe! 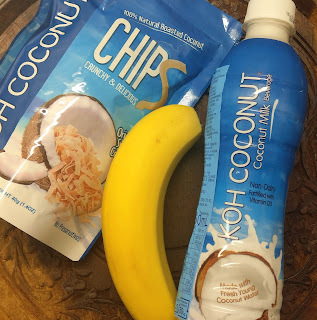 I will have to try this for a healthy post-workout snack! It does look and sound like a delicious recipe. I love some good noodles and my daughter does as well. Will have to try this out. And you are right, eating a light snack between meals helps.